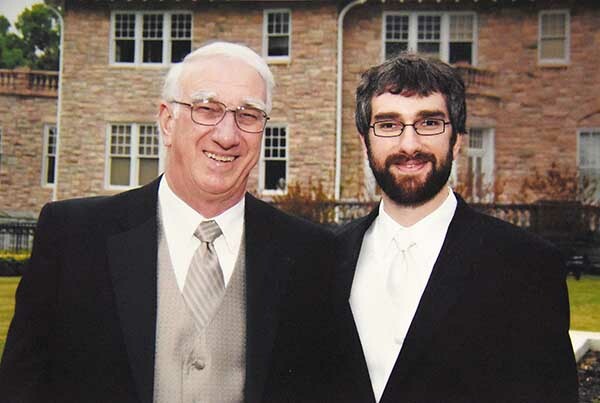 Dr. Arnold Postlethwaite, left, and his son, Dr. Bradley Postlethwaite. A father and his son at the University of Tennessee Health Science Center are gaining attention f0r their contributions concerning autoimmune disorders. Arnold E. Postlethwaite, MD, AB, is the Goodman Chair of Excellence Professor of Medicine and director of the Division of Connective Tissue Diseases at UTHSC. He has been associated with the school since 1973 and with more than 150 publications on autoimmune disorders. And now the Postlethwaite impact is growing, as Bradley Postlethwaite, MD, Arnold's son, also enters the field of rheumatology at University Clinical Health, one of the faculty practices affiliated with UTHSC. While the elder Postlethwaite did indeed teach his son, he says he did not encourage him to enter the field of medicine. Dr. Bradley Postlethwaite "loves to interact with people, and in rheumatology you take care of patients all their life because most of the diseases we treat never get cured," Dr. Arnold Postlethwaite said of his son's choice to enter his same field of practice and research. The Postlethwaite duo is collaborating on autoimmune research, specifically for patients with scleroderma. It is estimated that 50 million Americans suffer from some type of autoimmune disease, including lupus, Crohn's disease, scleroderma, rheumatoid arthritis and celiac disease, to name a few. Autoimmune disease is also the top cause of morbidity for women in the United States. UTHSC is at the forefront of rheumatology research, and particularly rheumatoid arthritis (RA) research. RA is primarily the inflammation of joints that occurs when the immune system attacks the body's own tissues. In the 1970s, Dr. Andrew H. Kang at UTHSC and the Memphis VA Medical Center discovered and developed the rodent model of type II collagen-induced arthritis, which is used worldwide as a model for RA. More than 25,000 articles have been published on this model and the topic, and UTHSC has continued to receive grants from federal and private foundations for its pioneering work. The elder Dr. Postlethwaite has spent much of his research career studying collagen, as it plays a crucial role in understanding scleroderma or systemic sclerosis, and rheumatoid arthritis, his two areas of focus under the umbrella of autoimmune diseases. Today, Dr. Arnold Postlethwaite and other physicians at UT are studying how changing amino acids in peptides (altered peptide ligand, APL) can "turn off" the progression of arthritis in the animal model of RA. Dr. Arnold Postlethwaite conducted a phase 1 study funded by the VA in which patients took a daily solution of Type II collagen APL before breakfast for four months. The hypothesis was the APL solution could halt the immune reaction to Type II Collagen, with the eventual goal of helping RA patients slow the progression of the disease. The data are still being analyzed. In addition to the VA study, Dr. Arnold Postlethwaite is studying the relationship between UVB light and arthritis. The Dead Sea beaches in Israel have been a haven for RA patients who report feeling reduced symptoms for days after time spent in the sun. Researchers have established the benefits of vitamin D for RA patients, but the "beach effect" is actually UVB light providing temporary relief. "UVB is something different - it produces a potent and fast suppression of the immune system," Dr. Arnold Postlethwaite says, but he cautions the treatment poses a cancer risk. If researchers can better understand what the UV light does to the immune system, then a therapy could be developed without causing melanoma. Scleroderma occurs when there is an overproduction of type I collagen leading to hardening or "sclerosis" of the tissue and organs in the body. The skin and internal organs, such as the heart, GI tract and lungs, are susceptible to fibrosis, which impairs the function of the affected organ. There is no overall scleroderma treatment, but researchers are studying oral tolerance to type 1 collagen from cow skin, which is like human type 1 collagen as a therapy. A new test of genetic variants called single nucleotide polymorphisms (SNPs) is a major breakthrough to determine how researchers study oral collagen treatment in clinical trials. Drs. Arnold Postlethwaite and Weikuan Gu discovered a mutation that indicates a patient can't be toleratized to collagen. The marker is a sign that the patient will be resistant to oral collagen therapy, therefore researchers can more selectively identify systemic sclerosis patients for research studies. This SNPs study has not been published yet, but it's I process with arGentis Pharmaceuticals. The cost associated with autoimmune disease in the United States is around $100 billion annually, and to put that in perspective, it's estimated that the direct medical cost of cancer is $87 billion. While research for new therapies has progressed since the breakthrough rodent model at UTHSC in the '70s, there is potential for growth in understanding the immune system of the GI tract, where about 70 percent of the immune system lives.